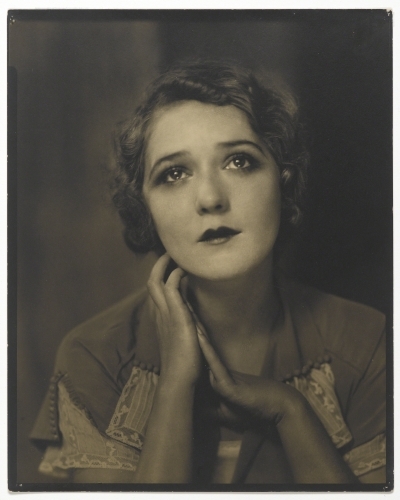 Mary Pickford (1892–1979, Canada) is a perfect subject for Steichen’s style of portraiture (and, yes, she won an Oscar in 1929 for Coquette). No doubt the melodramatic nature of silent movies was perfectly suited to a Pictorialist aesthetic in Steichen's portraiture of the 1920s. With the dramatic lighting, soft-focus, and doe-eyed, sanguine poses, Steichen set a standard in Hollywood portrait photography that continues to the present day, more or less. Pictorialism ("art photography") did not become popular in the United States until the 1890s. Photographers who worked in the Pictorialist style believed that their photographs came the closest to the aesthetic ideals of painting, this at a time when photographers struggled to get the medium accepted as “fine art”. These aims were achieved through the choice of romantic, sentimental, or allegorical subject matter; careful staging; careful and often dramatic lighting; and generally soft focus. Steichen, who began his career as painter, was an archetypal Pictorialist photographer from around 1895 to 1914. Steichen arrived with his family in the US at the age of 3. At 16 he had bought a camera, producing soft-focus, self-consciously artistic work. At 19 his photographs were accepted into the Second Philadelphia Salon of Pictorial Photography. All that time he was an aspiring painter, as well, and resolved to go to Paris to study it. On his way there he met Alfred Stieglitz (1864–1946), the greatest American photographer at the time and advocate of artistic photographer. Steichen helped Stieglitz found the Photo-Secession group dedicated to that style, and its dependent gallery "291." While studying painting in Paris, he decided to abandon it entirely for photography. Exposure to the Tonalist paintings of James Abbott McNeill Whistler (1834–1903, United States) and the French Impressionists while in Paris confirmed his Pictorialist style. Although Steichen had abandoned painting, he styled many of his photographs—in both composition and technique—as paintings would be. Soft-focus, softly lit, asymmetrical compositions typified his poetic style. His Pictorialism was curtailed when he served as an aerial photographer for the American Expeditionary Force during World War I (1914–1918). He was forced to give up his soft tonalities for straight edge, sharp focus photography. Steichen returned to the US in 1922 and established a studio in New York that specialized in advertising photography. Sharp, crisp imagery was important in that field. However, he was able to combine that style with the Pictorialist sensibilities in the photography he ultimately did for Vanity Fair and Vogue magazines—fashion photography and portraits of movie stars and famous personalities. 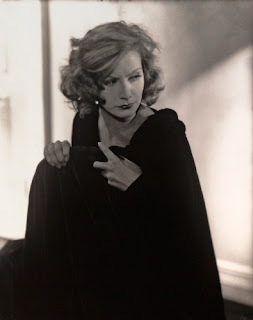 This is one of six shots Steichen took of the famous actress Greta Garbo (1905–1990, Sweden-US) while she was filming. No doubt the fact that she had just filmed a scene in which her character's husband had committed suicide contributed to the drama of her poses, which Steichen's Pictorialist style freezes magnificently in time.